Ok, you’ve completed your arc flash study and now all your electrical equipment is affixed with arc flash hazard warning labels. You may notice that the incident energy values are different from one piece of equipment to the next. How can electrical equipment that operates at the same voltage, is about the same physical size and supplies the same type of loads have different incident energy arc flash values? Usually, the answer is: clearing time. 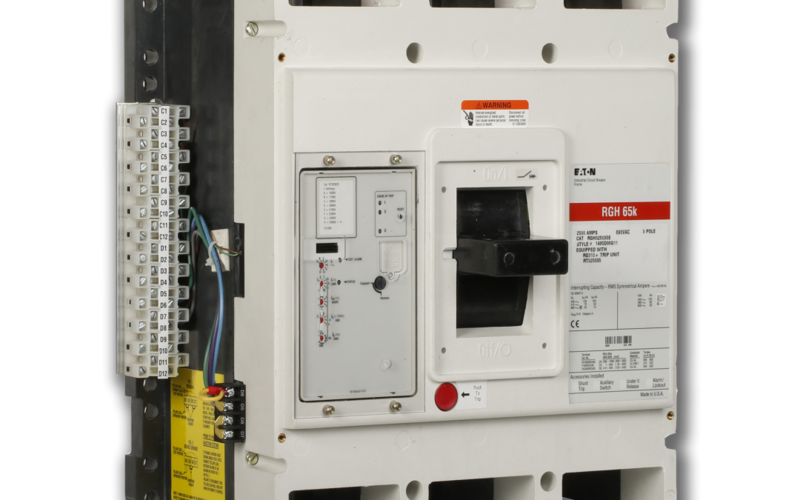 Clearing time is the amount of time it takes a circuit protection device to clear a fault. An arc flash occurs when a short circuit (fault) takes place inside of equipment. Once started, the flash will continue to expand until the upstream overcurrent protective device, such as a circuit breaker or fuse opens the circuit shutting off the supply of energy. If a fuse that blows quickly or has what’s called a short clearing time is installed in the circuit, the subsequent arc flash will be small because it doesn’t have time to grow. If the circuit relies on a fuse that has a long clearing time the flash could expand to a dangerous level. How do we determine the clearing time of a fuse or breaker? Manufacturers provide time-current characteristics (TCCs) with each of their overcurrent protective devices. The TCC depicts the clearing time at a certain amount of fault current using a simple XY graph. Look at the TCC for the breaker below (Figure1). The X-axis is fault current measured in kA the Y-axis is time measured in seconds. If this breaker incurred a fault of 10,000 amps it would open after approximately 10 seconds. This is the point where the red lines indicating the time and current intersect on the blue trip curve. Calculating clearing time for other amounts of current can be completed using the same method. The fault current is calculated by a professional engineer as part of your incident energy analysis or what is commonly referred to as an arc flash study. Your electric utility provides a supply of electricity to your facility and a request is made as part of the first stage of the study to determine the maximum amount of fault current available from this provider. For instance, you may have an 800A service entrance but if a dead short were created, there could be as much as 30,000 amps of current rushing into the facility until the utilities’ overcurrent device clears the fault. Using this information, the engineer can continue to the next stage which is determining how much resistance to current flow is built into the electrical systems of the facility. Wire sizes, wire lengths, etc. all have different resistances which effectively lowers fault current. Transformers are also included since they either increase or decrease fault current. Every device is then modeled in sophisticated software with the result being calculated fault values at each location in the facility. Once available fault currents are determined the information is cross-referenced to the applicable TCCs to end up with clearing times. 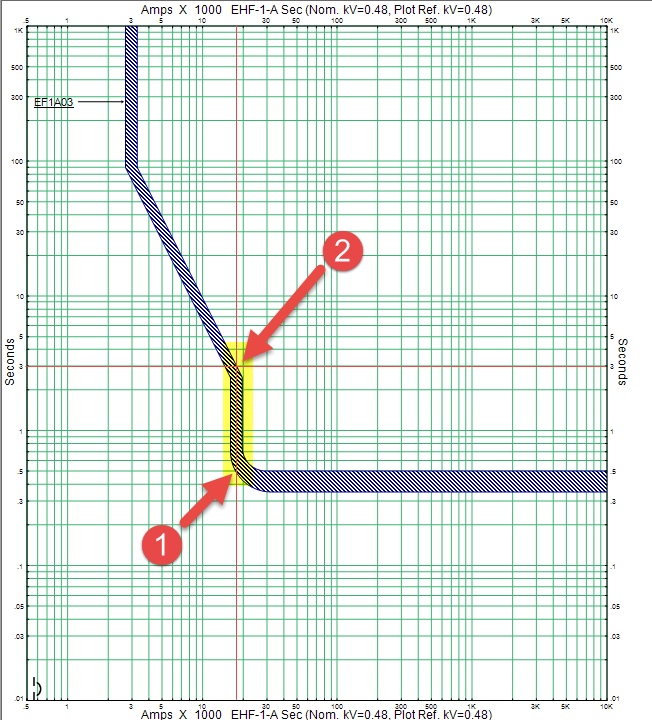 Ultimately these values are used to estimate incident energies and the arc flash boundary distances that appear on the arc flash warning labels. Mitigating can drastically reduce risk. Notice the yellow region in the same TCC below (Figure 2). Fault currents 20,000 amps and above will trip the breaker within 0.5 seconds or less. 20,000, 30,000, 50,000 amps all cause the breaker to trip in the same amount of time. This is because the breaker has entered its “instantaneous trip region”. Even though the fault current is much higher the size of the subsequent arc flash would be much lower due to the quick clearing time of the breaker. But notice in Figure 3 below what happens if a fault much lower were to occur, say 18,000 amps. 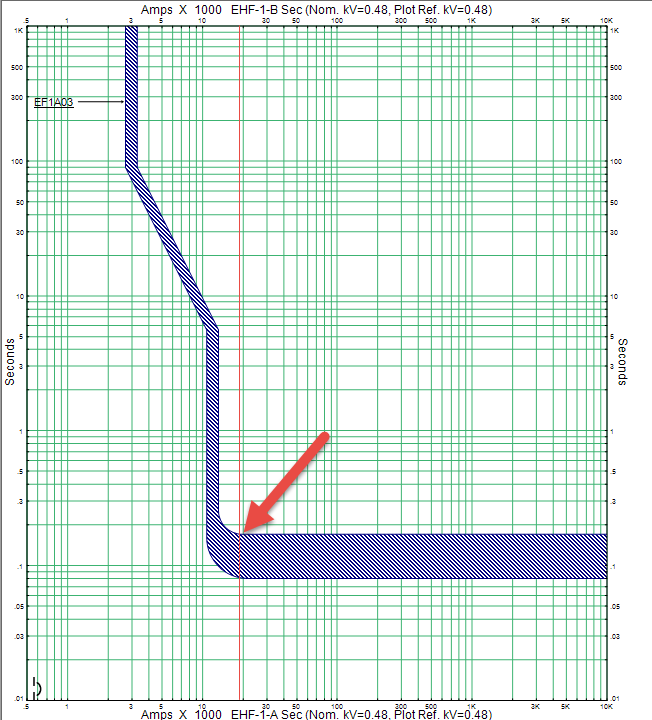 Notice that the red vertical line enters the blue breaker trip curve at ~0.5 seconds (indicated by arrow #1) and stays inside of the blue breaker trip curve until it reaches the 3-second mark (indicated by arrow #2), which time value would be used to determine the clearing time? 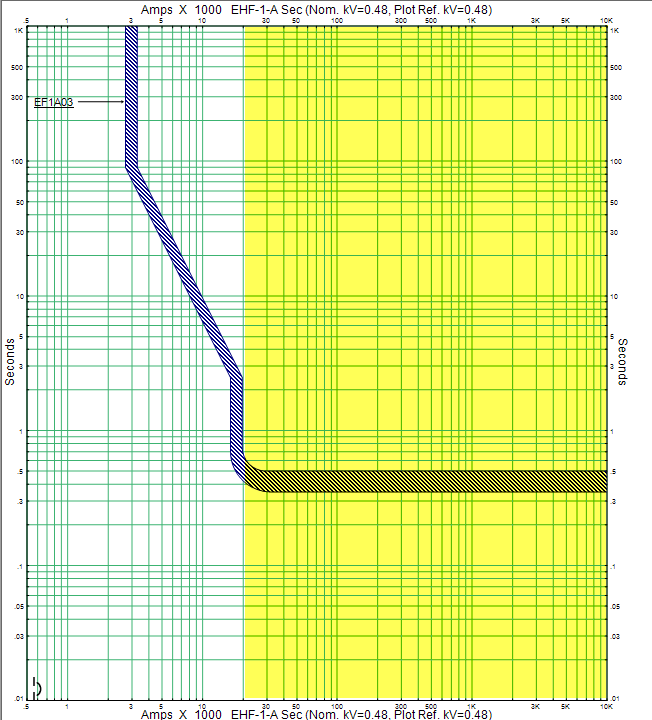 The blue line is thick because of the variability of the device. The vertical portion of the blue line (points between arrows 1 and 2) is the transition between the breaker’s “instantaneous” trip region into the breaker’s “short time” region. 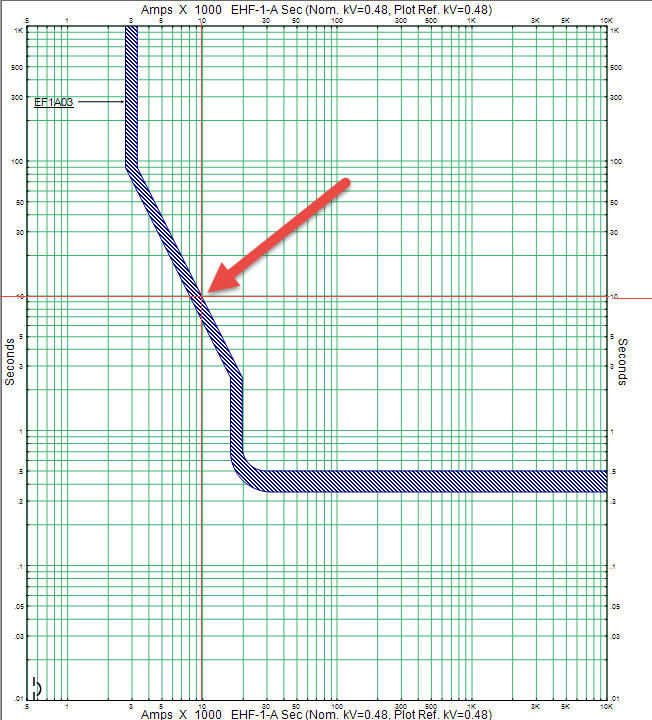 In the name of safety, engineers always calculate arc flash values using the worst case, consequently, the clearing time in this example would be 3 seconds. Unfortunately, if a fault were to occur with 18,000A of available arcing current, the breaker may never trip “instantly”, and the resulting arc flash could be very dangerous.